Stunning landscapes, a country with a diverse cultural history, mouth-watering food, cosmopolitan cities, warm and welcoming people – Turkey offers it all. 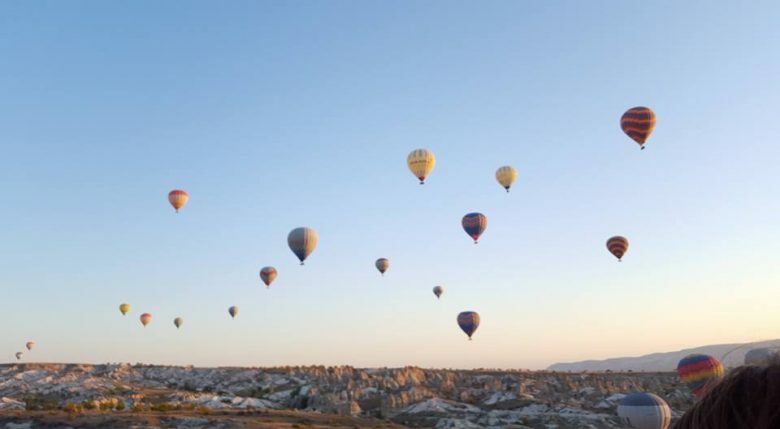 Ten lucky Travelstarters were recently hosted by Turkish Airlines and Renk Travel for an incredible five night educational in Istanbul and Cappadocia. Here are our top 9 reasons why Turkey has stolen our hearts…..
1. Easy access – Turkish Airlines flies into Istanbul direct non-stop from Johannesburg-daily, Cape Town-daily from 31st October 2016 (currently daily with technical stop in Joburg or Durban) and Durban-four times per week.Turkish Airlines offers economy and business class on all routes from South Africa. Four of us were lucky enough to experience their business class product on the Cape Town to Istanbul flight which include a very comfortable 188cm lie flat bed when reclined, 2-2-2 seating configuration and we got to catch up on our movie viewing with a choice of over 350 films. Not to mention award winning cuisine- Turkish Airlines won 4 Awards in the 2016 Skytrax Awards including: Best Airline in Europe, Best Airline in Southern Europe, Best Business Class Airline Catering & Best Business Class Lounge Dining. On our return flight we got to experience economy class which offers a 2-4-2 seating configuration with free advanced seating 90 days prior to departure, amenity bags, touchscreen in-flight entertainment and an adjustable footrest for added comfort. 2. Visas are free and South African passport holders can apply for their E-Visas online– it’s a very quick 5 minute painless process, and needs to be applied for at least 48 hours prior to departure from South Africa –https://www.evisa.gov.tr/en/apply/– Travel with a printed copy. 3. 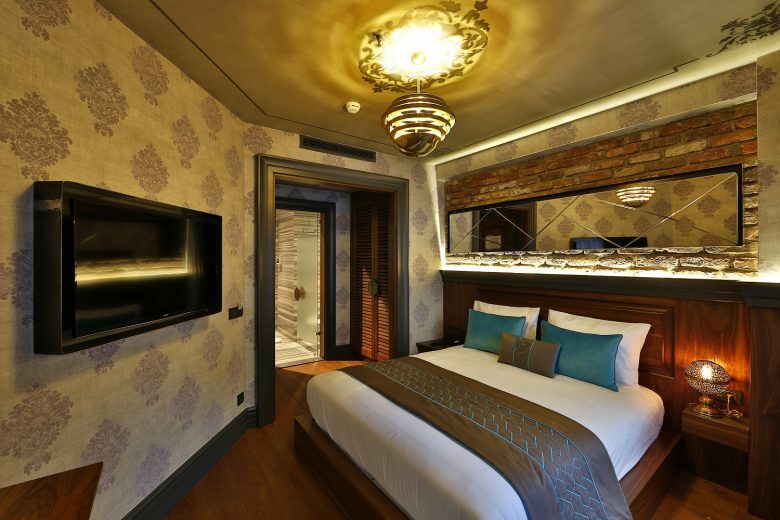 Wonderful choice of accommodation to suit all budgets– Istanbul boasts a wide range from global brands like Movenpick, Hilton and Sheraton to the more charming and smaller boutique hotels. We stayed at the 5 star Sura Hagia Sophia Hotel located in the Old City which was stunning and in a great location within walking distance to the popular sights. At night colourful lanterns transform the little streets of the Old City and provide many choices of local restaurants and street food to choose from for dinner. The other popular area to stay in Istanbul is near Taksim Square – for this area we would recommend the charmingly quaint Sanat Hotel Pera.In Cappadocia we stayed at the Ask-i Derun Boutique Cave Hotel, located in the small town of Uchisar, which was one of the highlights of our trip– every charming room is carved into the rock ad uniquely decorated in a different colour. It offers the most delicious breakfast-trays groaning with Turkish bread, cheeses, honey, olives, tomatoes, meats, Turkish Pancakes, tea and coffee. 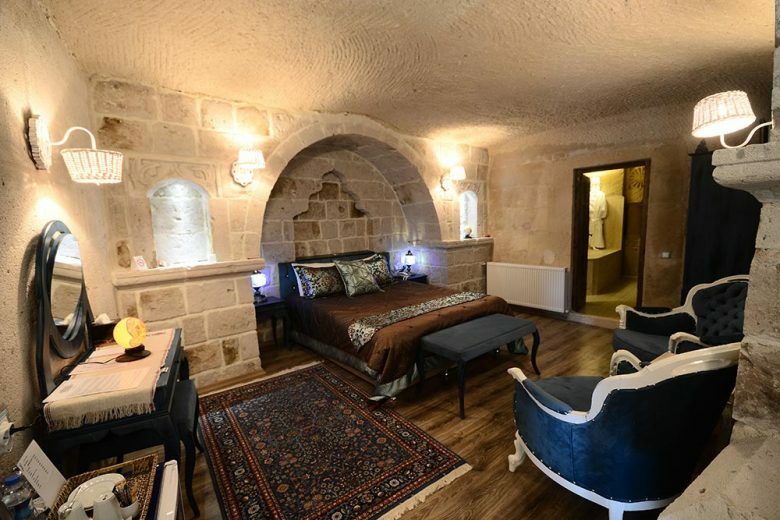 If you are looking for a slightly bigger town to wander around we can highly recommend the very popular Dere Suites Cave Hotel in Urgup. 4. Turkish food is scrumptious-revel in it! Ranging from traditional cheap eats like Simit which is a circular bread, typically encrusted with sesame seeds either served plain or with lashings of Nutella from little carts dotted all around Istanbul; to Lentil or Tomato soup which is a Turkish tradition. Kumpir is another form of popular street food-jacket potato with a crisp outer skin and soft inside, mashed up with butter and filled with your choice of cheese, pickles, sausages; Kofte which is their version of meatballs; street kebabs; to clay pots stew which is cooked in a clay pot and broken at the table for you to eat from. Turkish coffee is served black and with sugar and guaranteed to put hair on your chest-you can even you’re your fortune read from the coffee grounds. 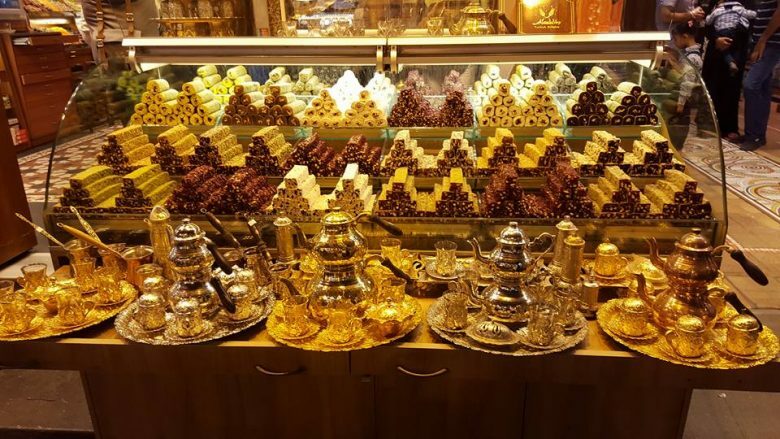 Turkish Tea is very popular and served sweetened in little glasses with no milk. Definitely try their delicious apple or pomegranate tea and there are lots of sweet deserts to choose from like Turkish delight and Baklava. Trust me you won’t go hungry in Turkey. 5. Istanbul – this cosmopolitan city spans the two continents of Asia and Europe – although you are likely to stay in Europe for most of your stay. It’s packed with sights, shopping, restaurants and culture-there is a mix of young and trendy with old culture and history. A three night stay will allow you to see the most popular sights of Hagia Sophia, Blue Mosque, Topkapi Palace, cruise along the Bosphorus, shop at the Spice Market and Grand Bazaar as well as Istiklal Street and visit the trendy neighbourhood of Nisantasi for a cappuccino and some window shopping. 6. 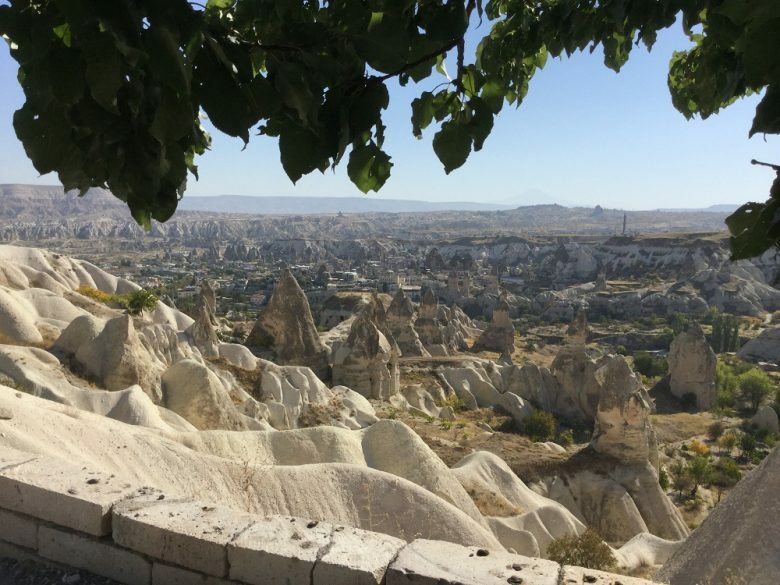 Cappadocia-we recommend you see Turkey beyond Istanbul-a short 90 minute flight from Istanbul to Nevsehir airport on Turkish Airlines followed by a half hour transfer ride delivers you to the dramatic and otherworldly Cappadocia- a region created by the erosion of soft volcanic stone by the wind and rain over centuries. Cappacodia provided us with a relaxing break and contrast to the pulsating and very busy Istanbul. Two nights/three days provided us with an opportunity to cross the must do Hot Air Ballooning off our bucket lists-the experience to see the fairy chimneys and dramatic landscapes from the sky is breath-taking and well worth the expense of EUR125pp, the rest of your time can be spent visiting the Göreme Open Air Museum containing the finest of the rock-cut churches, with beautiful wall paintings; Kaymakli Underground City-which are centuries old underground dwellings carved out of soft volcanic rock. The visit is incredible but you need to be physically flexible and able to bend to walk through narrow tunnels-some of us had to crawl on our hands and knees. You can also visit some of the ceramic, carpet and precious stone factory stores, and don’t forget to take a short walk into the beautiful Love Valley renowned for its phallic shaped rocks. 7. Shopping – there are many opportunities to shop in Turkey-our favourite was the Grand Bazaar and although it’s quite touristy you can find pretty much everything you are looking for at affordable prices from Evil Eye Magnets, beautiful colourful glass lamps, jewellery, water pipes, Turkish tea glasses, scarves, belly dancing outfits, Turkish t-shirts, ceramics and Turkish delight. Remember to bargain hard–they can be hard to say no to. Avoid being taken to the leather factory stores (although the fashion show is hilarious where members of your group will be hauled up to model) the products are just too expensive for South African budgets. 8. Turkish Hamman.Enjoyable? Hell no! An experience? Absolutely! Hammams are Turkey’s famous baths, many of which date back hundreds of years. The experience is a must but pack your sense of humour and shed your inhibitions – cost is 85TL per person which includes a mud mask, 15 minute sauna, a communal naked bath lying on a marble slab being washed by a stranger with a loofah brush, bubble bath and foam massage – they are usually in their bathing costume or bra and shorts, by the end you don’t care much about being naked in front of your work colleagues and will gladly skinny dip in the communal swim followed by an optional full body 20 minute oil massage at an additional cost. Other treats– We were also treated to a very interesting tour of Do&Co in Istanbul which is Turkish Airlines’ Catering Company. We were served lunch seated in a business class cabin mock up followed by a tour through the kitchens where we witnessed over 2,000 meals being prepared daily for Turkish Airlines flights departing to almost 300 destinations worldwide. The planning and logistics that go into ensuring that right meals arrive on time, at the right temperature on the right aircraft is nothing short of miraculous. 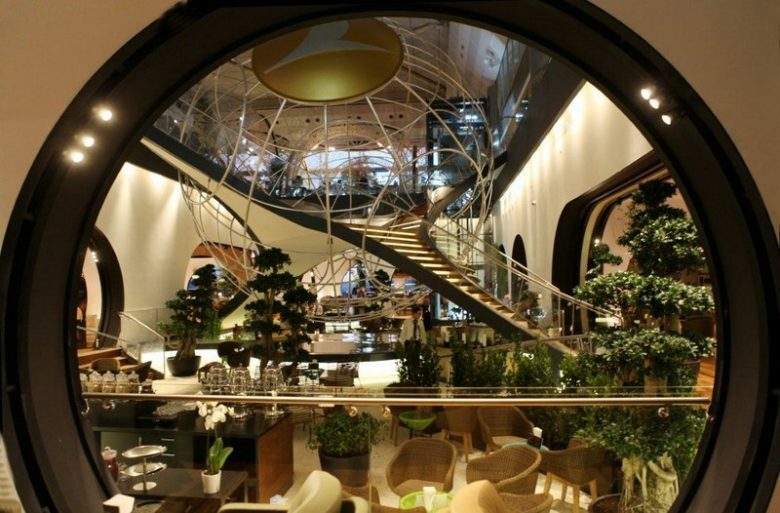 We were treated to a few hours in the Turkish Airlines Departure Lounge at Ataturk International Airport in Istanbul – it will certainly impress even the most jaded traveller. It is situated in the international departure hall and covers 6,000 square meters over 2 floors and includes a wide range of food and beverages, plenty of space to relax, shower facilities, mobile masseuse, cinema, cappuccino bar, billiard table, golf simulator, playroom for children, printers and computers, glass lockers and complimentary WIFI throughout. 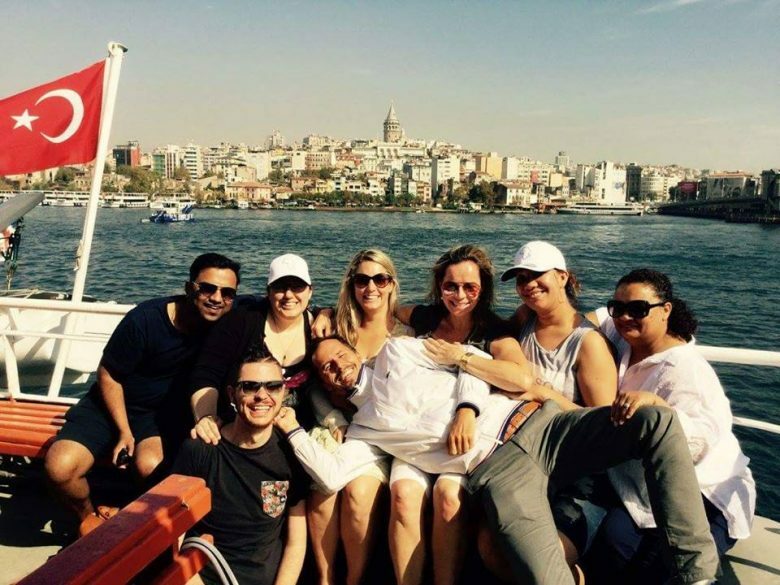 Travelstart was hosted by Turkish Airlines and Renk Travel – Thank you so much to you both for making our incredible trip possible and to Turkey for your warmth and hospitality-we fell head over heels in love and looking forward to returning one day. To chat to one of our professional travel consultants please call us on 021 020 0559, Or email travelbar@travelstart.com and we will gladly quote and book your magic carpet ride to Turkey. 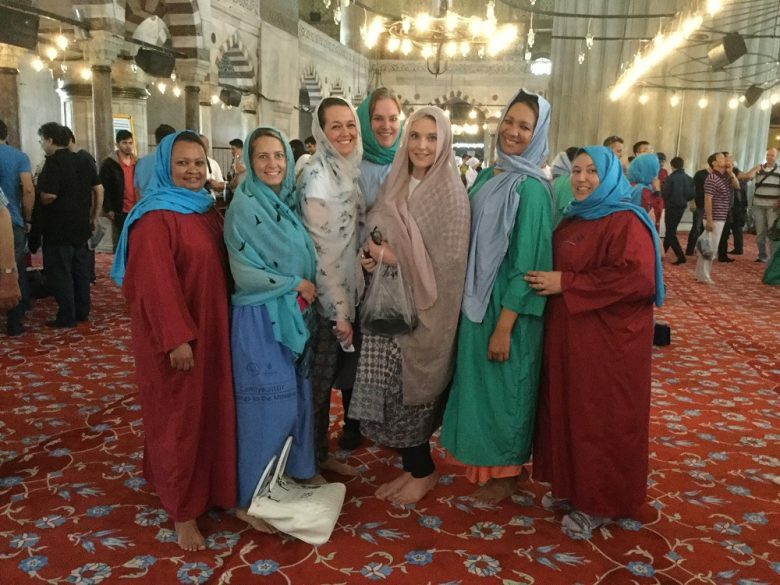 The post Travelstart’s Magic Carpet Ride to Turkey appeared first on Travelstart Blog.